Learn how to build a customer service Balanced Scorecard step-by-step. Start with a general business model, analyze the main business challenges, and convert them into a strategy map with KPIs. Customer Service Scorecard online - sign-up with a free account for immediate access to 16 scorecard templates. Customer support should be fast, good, and inexpensive – a classical project management triangle, where one can pick any two options. With a right approach to the strategies and KPIs, an organization can balance on these three options, and have excellent customer service at a reasonable price. In this example we create a Balanced/Strategy scorecard. As its name implies, this addresses the challenge of strategy execution. If you plan to use it for the customer service in your company, make sure that it is aligned with the overall strategy of your organization. 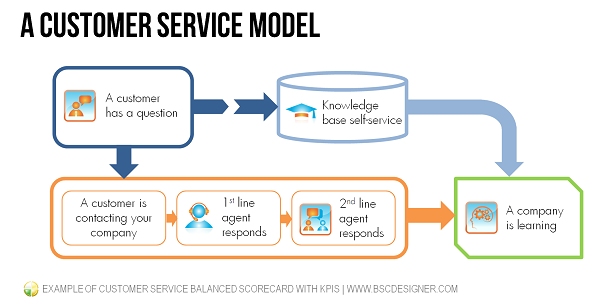 If your goal is to be more specific and address the operation issues of customer service, then you will find some examples of indicators for a KPI scorecard in the final section of this article. As we do recommend in our KPI system: have a look at the business process, find its inputs/outputs, activities/results, and bottlenecks. 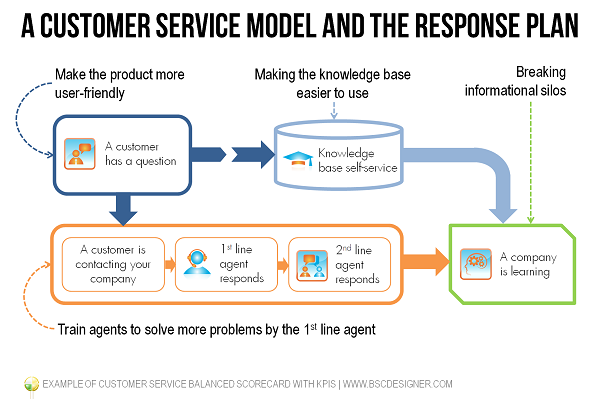 If you decide to build a Balanced Scorecard for your customer service, then I’d recommend starting with a model of how it is working now. A customer or a prospect client has a question about your product or service. A customer is contacting your company via a contact form, social networks, or phone call. First-line customer support specialist is trying to answer the question. If the problem is a tough one, then the issue is transferred to the second-line agent. A company is learning: the product is improved; the knowledge base is updated if needed. What might be the possible goals/response plan for this model? 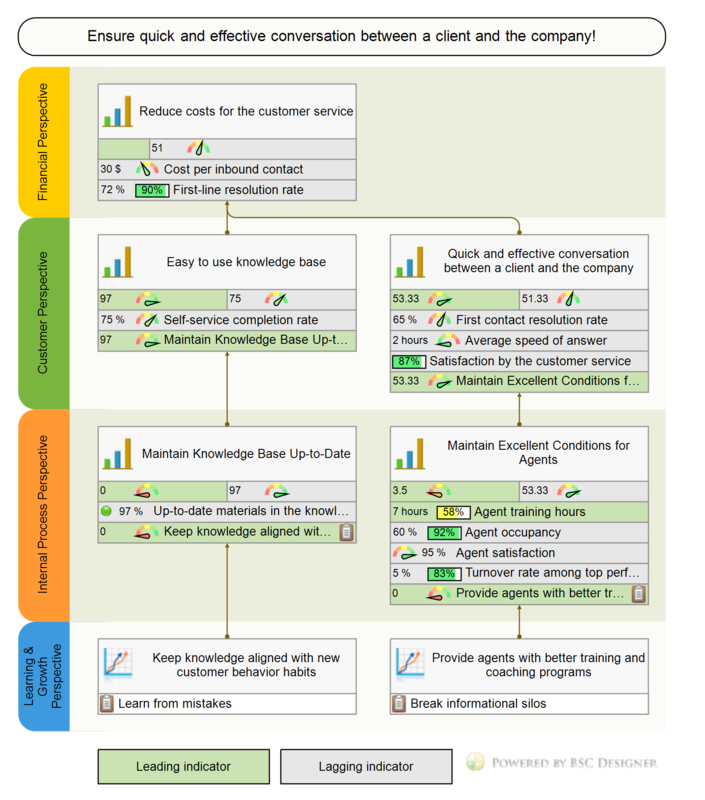 Addressing Step 2: Making the knowledge base easier to use so that customers could solve more problems themselves. Addressing Step 3: Train your first-line agents so that more of the difficult problems could be solved without transferring them to the 2nd line specialists. Addressing Step 4: Make sure that there are no informational silos between customer service and other business units. Let’s put these goals on the strategy map to reflect the cause-and-effect relationship between them. We can also add more details, and align them with the goals’ proper metrics. We need to review the model described above once again and locate the points where the main costs are produced. Let’s discuss an example of how the costs of customer service can be managed. Broken appointments or FTA (Failure to Attend) is one of the typical examples. Clients forget about their compromise, and can affect the tangible costs. The costs might vary from insignificant, like in a case of no show for a online demo call, to important, like a dental practice, for example. Calculate the FTA cost to understand if FTA is important for your business. This will also help to get a buy-in from the stakeholders. Develop response time. A simple recall system proved to be effective in most cases. Do client profiling. Analyze the profile of the clients where FTA is typical. For example, a study for the dental care domain (“The Reduction of Broken Appointments in General Dental Practice”) shows that the majority of patients that were failing to attend an appointment were unemployed. In the Customer perspective we need to map what customers want a client service to be like. A typical mistake is to map here the behavior that the organization wants to see from its customers. Another important nuance is that besides external customers of the organization, there also are internal ones! Your employees and your partners will also need to get in touch with your customer service. You might want to have specific goals and indicators for the internal customers as well. Leading indicator: % of the up-to-date materials in the knowledge base. The lagging indicator in this case is very subjective. You might have an excellent knowledge base, but your clients will still prefer to ask “typical” questions in person. Nothing bad about this; to qualify the value it makes sense to compare it with the historical data. In simple words, this goal means that a customer is asking a question and gets a detailed answer within a reasonable time. A typical action plan in this case is to train your customer service team. What about another popular indicator: Net Promoter Score? I saw some customer service scorecards where this indicator is used together with “Satisfaction by the customer service,” but the problem is that NPS is strongly influenced by the company’s product/service, so it might be hard to distinguish the specific contribution of the customer service. The same might be said about “Satisfaction by the customer service,” but the degree of influence is less than in the case of NPS. As you can see on the strategy map, the goals from the “Customer” perspective are linked by cause-and-effect connections with the goal in the Financial perspective. Active usage of the knowledge base and effective answers to the client’s questions will lead to lower costs for the company. 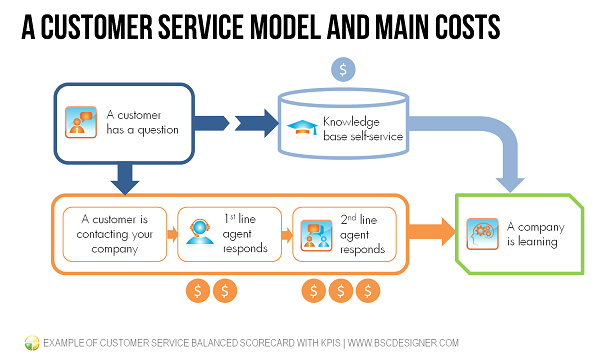 One might argue that this model pushes customer service specialists towards giving fast, but less useful answers. That’s not true. First, we have “Customer satisfaction” indicator to make sure that we are leading customer service in the right way; second, there is an implied goal in the “Finance” perspective – “Increase organization’s profits,” so whatever we do, it should help a company to earn more in long term, not just to cut short-term costs. You can go more into the details by adding more sub-goals and indicators related to the training efficiency and effectiveness. On the other hand, high “Agent occupancy” means high work load and as a result a high turnover rate. Your metrics will help to qualify the results obtained. According to some reports you can expect a dramatic growth of “Turnover rate” when “Agent occupancy” hits 70%. A question for this perspective is: where should an organization focus their learning efforts in order to serve clients better and achieve goals from the financial perspective. Here you might add the goals related to understanding clients’ needs better; the goals that will help to improve agent training and coaching programs; and improve the way the customer service team is communicating with other business units. If the problem was reported by a customer, was it reported to the developers? If there is some typical issue that customers struggle with, was a knowledge base revised? Goal: Keep knowledge aligned with new customer behavior habits. Is the knowledge base mobile-friendly? Do we have a version for print, an online version? Do we have guides in a video format? Do we provide enough tools and technical knowledge to the agents? Do we help them to improve their communication skills? What needs to be improved in the communication between customer service, IT, Developers, Marketing and Sales? Find and eliminate possible informational silos. The list goes ahead. My recommendation is that there is no need to track all these metrics, the best approach is to understand the current business goals, and find metrics that will help to track progress towards these goals. A final word. Think about behavior induced. The main recommendation in this context is to think about the behavior that your new indicators will induce and if your current measurement culture can support these changes. Do you have any thoughts? What are your favorite metrics for customer service? Feel free to share. Customer Service Scorecard discussed in this article as a starting template for your own scorecard!